Hyde Park, NY – Ivan Orkin, chef and owner of Ivan Ramen, was the keynote speaker during commencement exercises at the New York campus of The Culinary Institute of America on November 30. 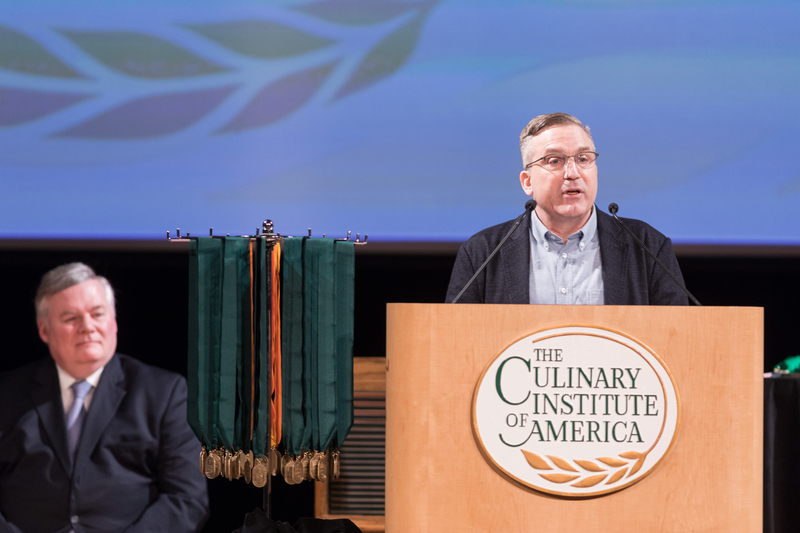 During his address, he challenged new CIA graduates to not be impatient and to take the time to fine-tune the skills that will make them leaders and true chefs. The 1993 CIA graduate is widely recognized as the leading American authority on ramen noodles and Japanese cuisine and culture. That journey began as a 15-year-old dishwasher at a sushi bar in his hometown of Syosset, NY. After graduating from the University of Colorado with a degree in Japanese language and literature, he moved to Japan to teach English. He returned to the U.S. and enrolled at the CIA to advance his culinary knowledge and skills, then moved back to Tokyo, where he opened the first Ivan Ramen. Chef Orkin quickly found success, despite being a foreigner specializing in one of Japan’s signature indigenous foods. Chef Orkin brought his winning formula to New York City in 2013 with Ivan Ramen Slurp Shop and an Ivan Ramen restaurant. The restaurateur expanded to pizza with the 2017 opening of Corner Slice in New York’s Gotham West Market. He is the author of Ivan Ramen: Love, Obsession, and Recipes from Tokyo’s Most Unlikely Noodle Joint and the forthcoming The Gaijin Cookbook. New York magazine named Ivan Orkin its Best New Chef in 2014, and Ivan Ramen in New York has been honored as Best New Restaurant by The New York Times, one of the Best Restaurants in New York by Condé Nast Traveler, and among GQ’s Best Restaurants in America. Corner Slice was named Best New Pizza in New York—no small feat—by both Gothamist and Eater. The entire CIA commencement ceremony, including Chef Orkin’s address to recipients of associate degrees in Culinary Arts and Baking & Pastry Arts, can be seen online.